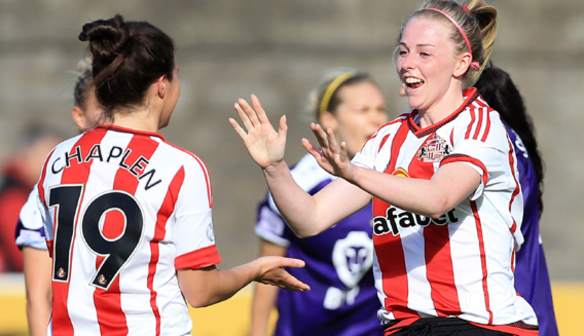 Emily Russell is a supporter of both the men’s and women’s Sunderland sides, and regularly travels down from Scotland to attend their matches. She is a season ticket holder, a member of the Supporters’ Club, and occasionally makes podcasts with her friends reporting on the trials and tribulations of the Lady Black Cats. How has the season been for Sunderland so far - how are you feeling about the relegation battle? What are your hopes for the rest of the season? One word I would probably use to describe our season so far is lacklustre. After coming off the high that we achieved last season it was an extremely disappointing start to the season where we failed to pick up a win and struggled against teams that we should have been picking up points from. I'm confident, maybe stupidly so, that Sunderland will manage to get themselves away from relegation, since that's what our club is really good at. However, in order to do so I'd really hope for another win against Doncaster and the team to start picking up crucial points in their last few games. The highlight of the season is definitely the home win over Doncaster. It was wonderful to see the players enjoying a match for once this season and being able to play comfortably like we did for a lot of last year’s season. Although not a specific result or moment in the season, a major lowlight that stands out is the disappointment we have watched our players endure. They go out every week against all odds and give their all no matter what, and results just seem to keep going the wrong way. Seeing them leave the pitch upset hurts more than any individual result ever would. Which player has been most impressive for you this year? Without a doubt I believe our star player this year has been Stephanie Roche! After a disappointing season last year I think a lot of people doubted her ability, but luckily we persevered and she's really shown an improvement on the pitch. She's definitely more confident on the ball and has been crucial to a lot of our big plays this year. It's been a bit disappointing seeing her left out of the starting XI recently but when she's on the pitch she works wonders for us. On the field I think the best thing is the amount of passion that our players have. You can tell that when they step on the field they are not only playing for themselves and their team-mates but also playing proudly for the badge on their chest. They go out there with confidence and determination week in, week out and play their hearts out because the club means so much to them. As for off the field I think it's a similar thing, and that's how at Sunderland we're all a family. A lot of the fans know each other and the players know a lot of the fans, meaning that it feels like one big group of people who are in it together regardless of the result, and generally it's just an extremely nice thing to be associated with. In 10 words or less – why should everyone get down to Sunderland's next home game? Support lasses in relegation battle, plus a great day out!